“What is the difference between a sentence and a picture? A sentence is repeated until its pattern weaves a thread of a sentence, a paragraph, a book. Francesca Capone’s Oblique Archive is as much of images as it is of materials as it is of writing. Archiving written texts that are as yet unwritten, an unwriting even as she writes, in ink on paper and thread on fabric, the form of a text in another form. Letters that form words that form sentences, a series of content-driven visual decisions manifested through mark-marking. 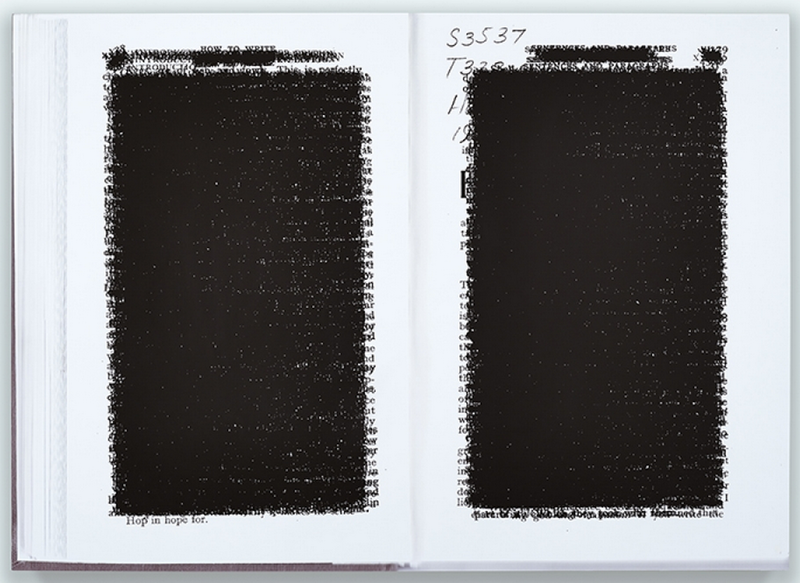 In Facsimile Compression, Capone overlaps texts from a variety of sources ranging from Paul Auster to Gertrude Stein, Leslie Scalapino to Yoko Ono, onto one visual plane, causing both a coincidence of language and a near total obfuscation of meaning as the layered texts accumulate to form thick, dark shadows – almost images – that are laid out like facing pages in a book spread. Repetition as insistence and endurance through the text that displays all of itself but will not let itself be read. 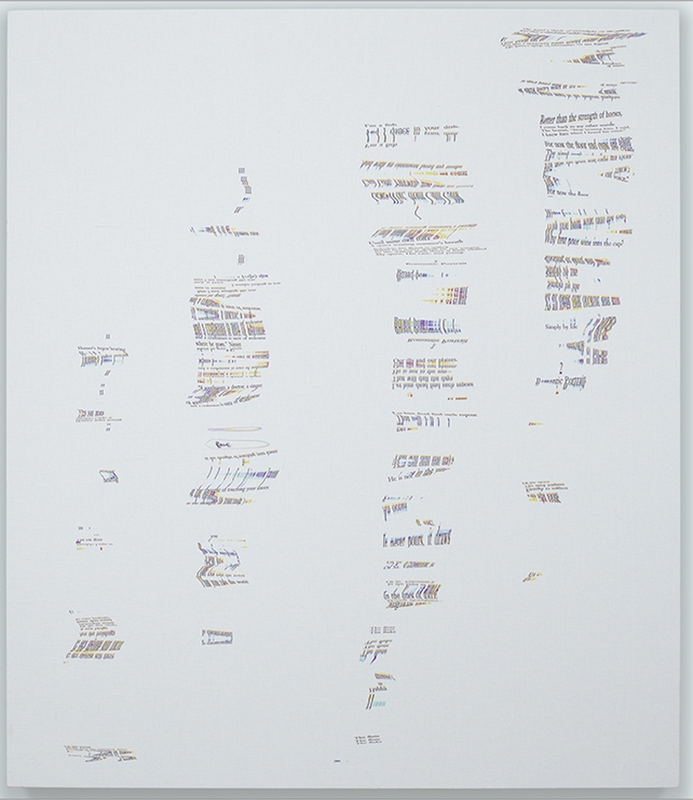 In the eponymous series of digital scans of poems, Oblique Archive, Capone drags words along the scanner bed, physically manipulating their shape, size, and legibility during the scanning process. The resulting giclée prints are carefully composed variations on the original poems, where the repetition of words and phrases marks an insistence on the material properties of text-based, digital images. Each poem gathers speed or slows down as words, dragged along the scanner, drip, waver, loop, and undulate across the page. Scanning, which is accompanied by the emergence of CMYK color elements, converts text into image through a painterly process. Capone’s jacquard weavings, Complex Operation of Combining and Touching Language/Hand Scan Hansjörg Mayer foreground the gesture of drawing a poem in fabric in their attempt to take typographic form and code it into the woven drafting system. Sublimating the hand that weaves, scans, writes and types into an industrially-woven representation of the hand piecing together disparate letters (as well as gesturing communicatively through sign language), Capone’s woven works are consummate emblems of the shared vocabulary of poetry and weaving, both of which reach new collaborative potentials through the interlacing of letters on fabric. 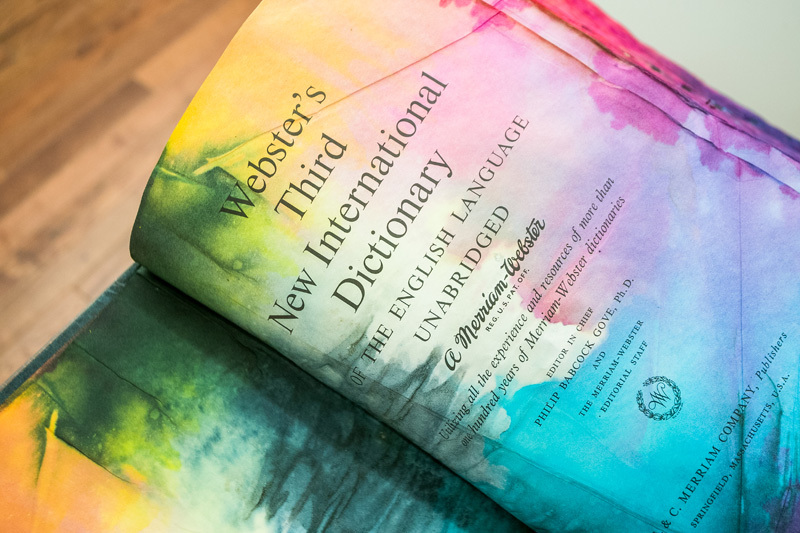 In the center of the room, an assemblage of Britannica encyclopedias and a copy of Webster’s Unabridged Dictionary, saturated in vibrant CMYK dyes, highlight the increasing obsolescence of printed reference books as the digitization of their textual components gives way to their disuse as material objects. Using subtractive color schemas employed in digital printing to transform the books, Capone translates them into new, manually printed objects, whose content and readability becomes irrelevant, just as the objects themselves have lost their relevance in the age of digital information. Francesca Capone is an interdisciplinary artist working primarily between the visual and the textual. Her work encompasses typography, textiles, poetry, painting and digital media. Capone's work has been exhibited domestically and abroad. She runs a design studio under the name Ampersand Knot and co-edits O'Clock Press with Kit Schluter and Andrew Dieck.